Over the course of this past academic year, I tasked my students with writing 150 entries–at least 150 words per entry–in their Writer’s Notebooks. I assigned specific topics, theme-weeks, story starters, and a lot of free writing over the span of those entries. I collected their work every three weeks (calling these due dates “checkpoints”), checked up on their writing, and gave it right back so they could keep going. For the final checkpoint, I was burnt out and recently spent almost all my energy grading big inquiry-based argumentative essays and co-creating a live action role playing game inspired by Fahrenheit 451 (This will definitely be a post later on). I didn’t plan anything special for their final submission, so it was unassigned free-writing. But I received quite a gift from a few of my students! On their final entries, many of my students decided to treat it like a yearbook and leave me notes of appreciation, some thanking me for making them do all that writing. This is his final entry of the year. I appreciated the attention to his commitment, “150 pages, almost 23,000 words . . . .” But stop and think about that. What an accomplishment for any student! (Before the start of the school year, I wrote a post titled Get Your Students to Write Over 20,000 Words This Year.) I’m proud of him already, but then he hit me with some humor, “and a few dozen hand cramps later, and here we are.” He knows this will charm me, his audience. I appreciate his nod to his growth, and of course I like being thanked. The next part wasn’t much of a surprise, since many students had made themselves abundantly clear about this, “When Mr. Frieden first assigned this notebook, I thought it was one of the worst things to happen to me, ever.” Isn’t that how it is for us teachers? We work really hard for our students’ benefit, and usually this is all we get in return from them. But Robert goes on, “It wasn’t as bad as I thought, though.” Wait, what!? Okay, I’m listening. “As a matter of fact, I have learned so many positive things about writing . . ..” Stop! Victory! I can now walk off into the sunset. Mission accomplished. But, wait! There’s more! “. . . [I have learned so many positive things] about myself, believe it or not.” Hello! I wasn’t expecting this. I really was only trying to impact their academic lives, not . . . their whole lives. He goes on, “It’s all been an unforgettable journey. Even the hard and stressful times I had trying to get a checkpoint done.” He did have some points of struggle. He was always honest with me about them, and I worked with him to give him the space that he needed. I also helped talk him through a difficult situation during the year. He wasn’t kidding. Then he finishes by saying that he’s going to miss it. He wasn’t alone either, there were other students who said they were going to miss writing in their notebooks. One of my sophomores claimed that she had already picked up her own journal outside of class. She did this on her own. For no points. What!? The Writer’s Notebook is so much more than a tool for helping students learn to write better for their teachers. Yes, that happens, but if you work to develop young writers, young men and women, then the Writer’s Notebook can become so much more than a composition book filled with poor handwriting. I have so much more to reveal to you about the value contained in their pages. If you’re on the fence about using a Writer’s Notebook in your class, I encourage you to take the plunge. It is completely worth the effort. Just for the space for students to have the freedom to write about what they want is worth it. But there are so many more applications with the Writer’s Notebook that I look forward to tell you all about in upcoming posts. But you don’t have to wait. 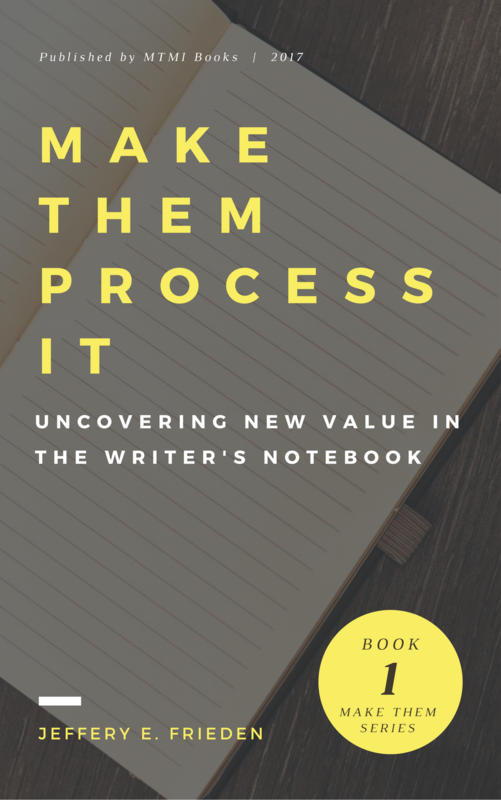 I put all my best insights in a book: Make Them Process It: Uncovering New Value in the Writer’s Notebook. It does more than tell you about how great a Writer’s Notebook can be and then show a bunch of great examples. It’s a step-by-step guide for setting things up, running them, and pulling out maximum value by having students revise and reflect on their writing. Have you ever taught writing with the Writer’s Notebook? It’s the BEST instructional tool I have ever used? If you don’t agree, change my mind. What’s better? If you haven’t already, like the Make Them Master It Facebook Page and follow MakeThemMastrIt on Twitter. I can’t wait to talk about how we can increase the impact we can have on our students! I have read your book – well, I actually highlighted your book – a few weeks ago and I am super excited to put your words into action! I flirted with the Writer’s Notebook during the last three weeks of Spring Semester and I was absolutely floored at the positive reactions of several students. One student wrote, “I will always remember Mrs. Williams’ class because that is where I found my voice in writing.” Talk about being blown away!! The only thing I am going to add is a section for Choice Read (aka Penny Kittle’s note from Book Love). This section proved to be an invaluable resource for my students throughout the year. Hopefully I can keep the momentum going for both reading and writing! Thank you for the inspiration and the simple basics!! And this floors me! Thank you for the kind words. I’m am excited to here that my work had a positive impact! Read your post! It gave the set up, the why, and the research behind the why (which was pretty dense, like eating a steak… I’m stuffed!). What I’m wondering is what were the results? How did it go? I’ll post he question on your blog, so you can answer there.